To begin this article, we have copied and have pasted the following from the below mentioned web site. We do not want to distort what the Catholic Church proclaims concerning this most important subject. There are other Catholic sources which say the same thing as this site does. Following what we have taken from this web site, we will discuss what the Bible has to say on this most important topic. Unfortunately when I am trying to transfer what is on their web site it does not transfer correctly. The immunity from original sin was given to Mary by a singular exemption from a universal law through the same merits of Christ, by which other men are cleansed from sin by baptism. [I want to interject my thoughts here in case I forget to later in this article. It is taught in the Catholic Church or at least it was when I was a child attending it that when a baby is sprinkled (not immersed as taught in the Bible) at baptism it washes the original sin from them and they are cleansed from it. The Bible gives no indication of this being done at baptism, in particular sprinkling baptism or baptism by immersion. I do not know what the Catholic Church teaches today if the baby dies before it is baptized because at least back when I was a member of the Catholic Church the baby went to live in Limbo for eternity, but I think that has changed. I do not know what the Catholic Church teaches today on this matter. Again I want to emphasize that pretty much everything that the Catholic Church teaches cannot be substantiated from the Scriptures.] Mary needed the redeeming Saviour to obtain this exemption, and to be delivered from the universal necessity and debt (debitum) of being subject to original sin. The person of Mary, in consequence of her origin from Adam, should have been subject to sin, but, being the new Eve who was to be the mother of the new Adam, she was, by the eternal counsel of God and by the merits of Christ, withdrawn from the general law of original sin. Her redemption was the very masterpiece of Christ's redeeming wisdom. He is a greater redeemer who pays the debt that it may not be incurred than he who pays after it has fallen on the debtor." The question begs to be asked, if this is true what the Catholic Church claims for Mary the mother of our Savior, Master Yahushua Messiah (Lord Jesus Christ), then what are the implications if what is said in this article are true? We want to let the Bible do the talking, and not so much what we have to say. I will interject my personal thoughts from time to time to hopefully help clarify what is said. Let us first address whether what is said on this Catholic web site can substantiated from the Scriptures. We will first show what is said in the next statement from this same web site to show you what they (Catholic Church sources) have to say on the matter. No direct or categorical and stringent proof of the dogma can be brought forward from Scripture. If you were to read through the rest of the site you would see that they do not bring forth any proof from the Scriptures to substantiate this teaching or as they call it – dogma. This is one of the basic doctrinal points of the Catholic Church and like most of what the Catholic Church teaches is without support of Scripture which they admit to! As a Protestant, we believe what is written in Isaiah 8:20 needs to be applied to every teaching put forth by anyone, whether Catholic or Protestant or whoever. “To the law and to the testimony: if they speak not according to this word, it is because there is no light in them.” People cannot just make claims about a matter without substantiation from the Scriptures to what is being put forth no matter who they are or claim to be. What is the issue or issues that are affected by what is being said in this article? First of all, was Mary born sinless? Did the law of hereditary not apply in Mary’s birth process? Was she exempt from “original sin?” First of all the term "Original Sin" is not found in the Bible. Then how did that affect the nature of Yahushua (Jesus)? Was Yahushua like you and me, or did He have an advantage over you and me because He did not have a fallen nature (Original Sin) like we have as the web site contends? If Yahushua had an advantage over you and me, then Yahuwah (God’s name meaning The Eternal Self-Existent One) cannot expect us to be like Yahushua and live without sinning? And if Yahushua did not have an inherited, fallen, human nature like ours then the same cannot be expected of us as it was of Yahushua? When Adam and Eve fell for Satan's lie and ate from the "tree of knowledge of good and evil," man was no longer in the image of the Creator as they had been first created. This is the account of of when Adam begat his first son. "This is the book of the generations of Adam. In the day that Elohim created man, in the likeness of Elohim made He him [Adam]. Male and female created He them; and blessed them, and called their name Adam, in the day when they were created. And Adam lived an hundred and thirty years, and begat a son in his [Adam's] own likeness, after his image; and called his name Seth" (Genesis 5:1-3, emphasis added). Adam could not pass on to his children what was no longer his. His nature was fallen because of sin. His nature was weakened because of sin. There is no Biblical record to show that Mary was born sinless. For the Catholic Church to make such a claim for Mary, without Biblical support, is of no relevance to anyone who accepts the Bible as the final authority on all matters of faith. What it does show can be seen in 1 John 4:1-3 and will be discussed later in this article. We know that Yahushua's (Jesus') Father was Elohim (God). “He shall be great, and shall be called the Son of the Highest: and Yahuwah Elohim [LORD God] shall give unto Him the throne of His father David” (Luke 1:32, emphasis added). “Shall give Him the throne of His father David.” This verse tells us that one of the earthly ancestors of Yahushua was King David, and the only way that could happen was through His mother, Mary. Without any Biblical evidence telling us otherwise, I believe it is safe to say that Mary had an inherited, fallen, human nature just like we all do who are born on this planet. 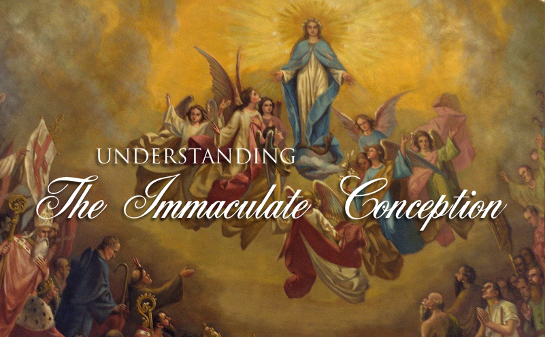 In Luke 1:28-30 “the angel came in unto her [Mary], and said, Hail, thou art highly favoured [It does not say that because you have been "immaculately conceived. "], Yahuwah is with thee: blessed art thou among women. And when she saw him, she was troubled at his saying, and cast in her mind what manner of salutation this should be. And the angel said unto her, Fear not, Mary: for thou hast found favor with Elohim.” There is no indication in this conversation that Mary had been immaculately conceived by her parents in order to become the mother of Yahushua. She had “found favour with Elohim.” She, like her cousin, Elisabeth and her husband, Zacharias, may have been “righteous before Elohim, walking in all the commandments of Yahuwah blameless” (Luke 1:6). To see the complete lineage of Yahushua and His ancestors you can read Matthew 1:1-17. When you examine the lineage of Yahushua you see what type of pedigree He had. In His ancestry you find Ruth, the Moabite. The Moabites were the offspring from the incestuous relationship of Lot with one of his daughters. You have David who lusted after Bathsheba and committed adultery with her and then had her husband killed. You have Jacob who was a liar. You had Manasseh who “shed innocent blood very much, till he had filled Jerusalem from one end to another; beside his sin wherewith he made Judah to sin, in doing that which was evil in the sight of Yahuwah” (2 Kings 21:16) and many others with character faults. You have all these faults passed on in the DNA (inherited, fallen, human nature) carried on down through Mary and ultimately were a part of Yahushua’s DNA (inherited, fallen, human nature) makeup. Did that make Yahushua a sinner? No! He simply had an inherited, fallen, human nature which is common to all mankind. “Yahushua said this in Matthew 26:41, “the spirit is willing, but the flesh is weak" (emphasis added). Yahuhsua did not say the flesh was sinful, but that the flesh was weak because of man being in a fallen state as a result of Adam and Eve’s failure. “Now the birth of Yahushua Messiah was on this wise: When His mother Mary was espoused to Joseph, before they came together, she was found with child of the Holy Ghost [Spirit] . . . while he [Joseph] thought on these things, behold, the angel of Yahuwah appeared unto him in a dream, saying, Joseph, thou son of David, fear not to take Mary thy wife: for that which is conceived in her is of the Holy Ghost” (Matthew1:18, 20). Who is the Holy Ghost? Many teach that the Holy Ghost or Holy Spirit or Spirit of Elohim is a third person of a Trinity of gods. The following is from our study The Holy Spirit – Elohim’s Life and Power. “The Holy Spirit is not a person distinct from the Father and the Son. The Holy Spirit is the LIFE AND POWER OF Elohim. Many people believe that the Holy Spirit is a personage, but we believe the Scriptures teach that the Holy Spirit is the impersonal power and life-force of Elohim. Let us carefully search the Scriptures to see what they reveal about the Holy Spirit and its operation. “And the Spirit of Elohim moved upon the face of the waters” (Genesis 1:2). The invisible active force of Yahuwah moved upon the waters and brought order and beauty out of the condition described here. “And the angel answered and said unto her, the Holy Ghost shall come upon thee, and [or even] the POWER OF THE HIGHEST SHALL OVERSHADOW THEE: Therefore also that holy thing which shall be born of thee shall be called the Son of Elohim” (Luke 1:35). The Holy Spirit is explained here to be the POWER OF THE HIGHEST. This verse gives us a Biblical definition of the Holy Spirit. “And behold, I send the promise of My Father upon you: but tarry . . . until ye be ENDUED WITH POWER FROM ON HIGH” (Luke 24:49). “But you shall receive POWER after that the Holy Ghost is come upon you: and ye shall be witnesses unto Me” (Acts 1:8). “And it shall come to pass in the last days, saith Elohim, I WILL POUR OUT OF MY SPIRIT upon all flesh” (Acts 2:17). “Hereby know we that we dwell in Him, and He in us, because He hath GIVEN US OF HIS SPIRIT” (1 John 4:13). “But if THE SPIRIT OF HIM [Yahuwah] that raised up Yahushua from the dead dwell in you, He that raised up Messiah from the dead shall also quicken [or make alive] your mortal bodies BY HIS SPIRIT that dwelleth in you” (Romans 8:11). “And what is the exceeding greatness of HIS POWER to usward who believe, ACCORDING TO THE WORKING OF HIS MIGHTY POWER, which He wrought in Messiah, when He raised Him from the dead” (Ephesians 1:19, 20). When all of these Scriptures are put together, we can clearly see that the Holy Spirit is NOT A PERSON . . . but an INVISIBLE FORCE . . . Elohim’s LIFE AND POWER. The Holy Spirit is not a person . . . it is the life of Yahuwah. Holy Ghost, Holy Spirit, Holy Life. It is the very essence of Elohim Himself . . . it is His Spirit or life-force. It is the invisible active force of Almighty Elohim by which He moves upon His children and accomplishes His purposes. The Holy Spirit is Elohim’s Spirit or life that can be everywhere (Psalms 139:7-8), and a portion of that Spirit comes into our being when we are born again. “Which were born, not of blood, nor of the will of the flesh, nor of the will of man, but of Elohim” (John 1:13). “Yahushua answered, Verily, verily, I say unto thee, Except a man be born of water and of the Spirit, he cannot enter into the kingdom of Elohim” (John 3:5). “But as then, he that was born after the flesh persecuted him that was born after the Spirit, even so it is now” (Galatians 4:29). A person that is "born of the flesh" is describing man in his inherited, fallen condition having not been "born again." I know that some will say that Yahushua was the “holy thing” mentioned in Luke 1:35. “And the angel answered and said unto her, The Holy Ghost shall come upon thee, and the power of the Highest shall overshadow thee: therefore also that holy thing which shall be born of thee shall be called the Son of Elohim" (emphasis added). What is meant by “that holy thing?” What does the word “holy” mean? According to Thesaurus.com holy can mean pure, clean, innocent, faultless, spotless, uncorrupted, untainted plus many more synonyms. When we hold any little baby in our arms, what thoughts come into our minds? Do not the words listed describe what that little child is at that point in time? There are many who believe that when we are born, we are born with a sinful nature. We are born with a fallen nature, but have we sinned at that stage in our lives? What is the Biblical definition of sin? “Whosoever committeth sin trangresseth also the law: for sin is the transgression of the law” (1 John 3:4, emphasis added). Do you think a baby is capable of sinning? I hope not! Let us examine the Scriptures and see what they say about the life of Yahushua. We will start in the book of Hebrews where Paul had this to say on the matter: “For verily He [Yahushua] took not on Him the nature of angels [The angels do not have a fallen nature. ]; but He took on Him the seed of Abraham. Wherefore in all things it behooved Him to be made like unto His brethren, that He might be a merciful and faithful high priest in things pertaining to Elohim, to make reconciliation for the sins of the people. For He Himself hath suffered being tempted, He is able to succor them that are tempted” (Hebrews 2:16-18, emphasis added). “For we have not an high priest which cannot be touched with the feeling of our infirmities; but was in all points tempted like as we are, yet without sin” (Hebrews 4:15, emphasis added). How is it when men/women are tempted? “But every man is tempted, when he is drawn away of his own lust, and enticed” (James 1:14, emphasis added). And if Yahushua had the same fallen nature that we inherit from our parents, then He too was tempted just like James tells us in this verse. How is it that He did not give into those temptations and sin? What was different about Him that kept Him from sinning, and when we find out what the difference was, can we have the same power that Yahushua had, and can we stop sinning also? Who was the other Parent of Yahushua beside Mary? Elohim, the Father. When Yahushua was born, He had Mary for His mother and Yahuwah (Elohim – the Supreme Being) for His Father. What did Yahushua tell Nicodemus during that evening meeting they had? “Marvel not that I [Yahushua] said unto thee [Nicodemus], You must be born again” (John 3:7, emphasis added). This is not an inconsequential matter! You MUST be born again! When a person is “born again” how does that take place and what happens to that individual? “Yahushua answered, Verily, verily, I say unto thee, Except a man be born of water [See our study Baptism Part 2 and what being immersed at Baptism means by clicking on the shaded area.] and [born] of the Spirit, he cannot enter into the kingdom of Elohim. That which is born of the flesh is flesh is flesh; and that which is born of the Spirit is spirit” (John 3:5-6, emphasis added). “Whosoever is born of Elohim [born again] doth not commit sin; for His seed [the Spirit of Elohim – Holy Ghost] remaineth in him: and he cannot sin, because he is born of Elohim” (1 John 3:9). There are certain conditions that must be met if one “doth not commit sin” or ‘he cannot sin.” In the parable of the sower of the seed found in Matthew 13:3-23, Yahushua tells us what happens when the seed is sown in certain types of ground and why they fail of producing results (fruit). Just like those dogs I was talking about earlier, we are determining who will win the battle in our life. You might want to read the entire parable of Matthew 13 because it tells us what happens and why the seed does or why it does not produce good results. I believe one of greatest reasons why “born again” Christians fall away from Messiah and go back to the ways of the world or remain in a lukewarm state is found in 1 John 3:6. “Whosoever abideth in Him [Messiah] sinneth not: whosoever sinneth hath not seen Him, neither known Him.” They lose that first love they had when they were first told about Elohim's love for them and what had been done for their salvation in the sacrifice of the Father’s Son, Yahushua. “Nevertheless I have somewhat against thee, because thou hast left thy first love” (Revelation 2:4). They have never been taught about how to abide in Yahushua. Yahushua said “I am the true Vine, and My Father is the Husbandman. Every branch in Me that beareth not fruit He taketh away: and every branch that beareth fruit, He purgeth it, that it may bring forth more fruit. Now you are clean through the word which I have spoken unto you. Abide in Me, and I in you. As the branch cannot bear fruit of itself, except it abide in the Vine; no more can you, except you abide in Me. I am the Vine, you are the branches: He that abideth in Me, and I in him, the same bringeth forth much fruit: for without Me you do nothing. If a man abide not in Me, he is cast forth as a branch, and is withered; and men gather them into the fire, and they are burned. If you abide in Me, and my words abide in you, you shall ask what you will, and it shall be given unto you” (John 15:1-7, emphasis added). The fact is without the Spirit of Elohim abiding in us we cannot produce any fruit because the fruit it is talking about in John chapter 15 is the fruit which the Spirit of Elohim produces in the lives of the people the Spirit of Elohim dwells in. “But the fruit of the Spirit [of Elohim] is love, joy, peace, longsuffering, gentleness, goodness, faith, meekness, temperance: against such there is no law” (Galatians 5:22-23). We cannot produce this fruit by trying to produce them in our strength and ability and is why many give up trying to become a Christian; it all starts out with being “born again.” When the Spirit of Elohim is abiding in us that fruit will be seen in our lives and not one will be missing. That is the evidence that the Spirit of Elohim is living in us, and we have been “born again.” We can and must have the same experience that Yahushua had while He lived on this earth through the same means He was able to live without sinning. “To him that overcometh will I grant to sit with Me in My throne, even as I also overcame, and am set down with My Father in His throne” (Revelation 3:21). And how is it that Yahushua overcame? “The Father that dwelleth in Me, He doeth the works” (John 14:10). And how did the Father dwell in Yahushua? By the Spirit of Elohim, just as He does in us when we are “born of the Spirit” (John 3:8). So unlike what the Catholic Church teaches, the Bible teaches that “Original Sin” which is actually the inherited, fallen, human nature will be with man until the second coming of Yahushua when “this corruptible [the inherited, fallen, human nature] must put on incorruption [unfallen as was Adam when he was created], and this mortal must put on immortality. So when this corruptible shall have put on incorruption, and this mortal shall have put on immortality, then shall be brought to pass the saying that is written, Death is swallowed up in victory” (1 Corinthians 15:53-54). “Original Sin” cannot be washed away by just pouring water over one’s forehead. Original Sin cannot be washed away when one is immersed. Elohim will change our vile bodies with the inherited, fallen, human nature into the likeness of Yahushua’s glorified body when He was resurrected from the dead by His Father. The tomb was empty when they came to it after Yahushua was resurrected. Yahushua was changed from corruption to incorruption when He was resurrected by His Father just as He will do for us when Yahushua returns. We will not be given new bodies, but these old bodies will be changed. There are in the world today many misconceptions of who or what the anti-Christ (Messiah) is, but this what it is according to the Scriputres.